Successfully Added MP3 Player for Lovers - Pair of 1GB MP3 Music Players to your Shopping Cart. MP3 player for lovers. 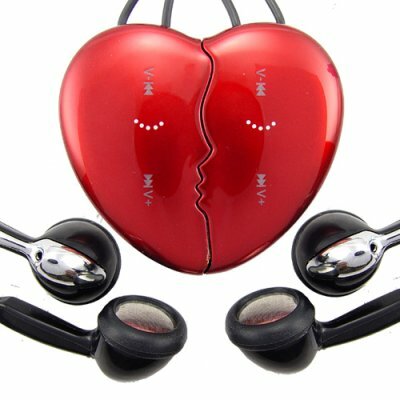 This beautiful package comes with two matching half heart MP3 players that form one full heart when paired together. Each MP3 player is half heart shaped and comes with a 1 GB of memory and simple touch sensitive controls for easy operation while being worn as a necklace. Small enough to be worn as a decorative necklace ornament or put comfortably into any pocket. This 1GB MP3 player has simple controls and an internal rechargeable li-ion battery for hours of enjoyment between recharges. Makes a wonderful personal gift for the person you care about in your life. Newsmy** Lovers MP3 Player is proudly brought to you by Chinavasion Electronics. In stock now for single piece or bulk orders. Brought to you from the leader in wholesale direct from China electronics, Chinavasion. Lovers Necklace or Pocket MP3 Player with 1GB of memory. Makes a great Valentine's or birthday gift for the one you love. **Newsmy is one of the top brand portable electronics and mobilephone manufacturers in China. You will find the quality of this brand to be as good as anything you could get from the store at your local mall, but at a much better price!